Among many questions homeowners have about kitchen remodeling, the ideal upper cabinet height is probably one of the most frequently asked. What should be the distance between the countertop and upper cabinets? What is the standard wall cabinet height? What are the different upper cabinet height options? Ergonomics is a key component of kitchen remodeling — if you don’t know how high to mount upper cabinets, you’re going to regret it later. Installing wall cabinets can be a tricky affair for many. According to kitchen cabinet experts, they should be low enough to let users reach the shelves and high enough to avoid the countertop feeling cramped. Plus, the measurement of the correct height also depends on the fact whether you install upper cabinets before or after the installation of base cabinets and countertop. #1 – Upper cabinet height from the counter: The ideal upper cabinet height allows the user of average height to reach the shelves comfortably, sans a step-stool or stretching their arms or back. #2 – Upper cabinet height from floor: The ideal upper cabinet height off the floor is 54-inch which is calculated from the floor to the bottom edge of the wall cabinets. #3 -Upper cabinet height standard: The distance between the “top of countertop” and the bottom edge of wall cabinets should be 18 inches. #4 – Upper cabinet height from floor: If one of your family members has a short height or physical condition preventing them from reaching the cabinet shelves at recommended height (54”), considering reducing the distance by a couple of inches. For example, the bottom of the upper cabinets can be 48” off the ground and 14” from the top of the countertop. #5 – Upper cabinet height over stove: The upper cabinet height above the ranger is even higher than the standard wall cabinet height. Why? Many cabinets being combustible pose a greater danger unless there’s adequate clearance between the range and the bottom of the upper cabinets. For safety reasons, keep a 66-72” distance between the floor and the cabinets above the range. While the standard height of upper cabinets is recommended to be 18” from the countertop, there are scenarios when you make exceptions for better functionality and greater benefits. While the standard 18” height is a norm for most households, it may not necessarily be “the best” for everyone. When the home chefs are taller than, say, five feet and ten inches, the upper cabinets should be mounted higher than the recommended height. Not only does it help them see the counter more clearly but also it allows them ample space to work at their optimum efficiency. Tall faucets with arching necks are a growing trend among homeowners these days. They are highly functional as well as stylish. However, when the upper cabinets are installed at a standard height above the sink, using these faucets can be a challenge. Therefore, the correct upper cabinet height above the sink, especially in such cases, is 24-30” off the countertop. A kitchen backsplash is much more than just protection for your wall against stain and splashes. It’s a form fact that makes your space beautiful and enjoyable. Raising the height of your upper cabinets allows more space for the backsplash, which gives your kitchen an eye-catching look. Dark kitchen cabinets are a hot favorite among many homeowners that want to have sophistication in their kitchen space. 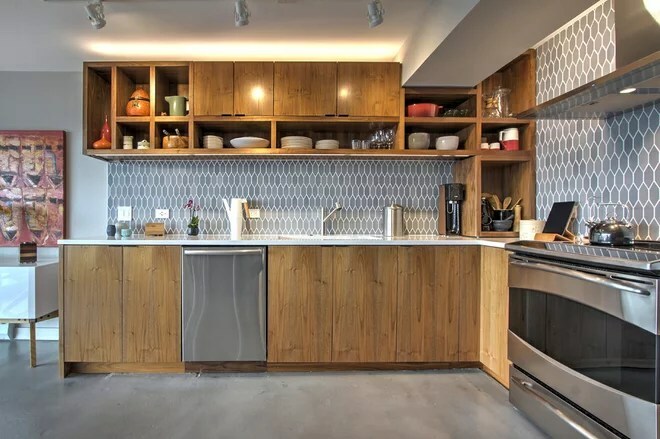 Since dark cabinets tend to be visually overwhelming in some decor, it’s important to maintain a proper distance between your base cabinets and upper cabinets and incorporate backsplash for a visual break. Two toned kitchen cabinets are growing popular these days. It’s a great way to add some personality into your kitchen without breaking your bank. If you choose a bold finish for your upper cabinets with base cabinets in contrasting color, you want to maintain the ideal distance between two so as to infuse some balance into your decor. The wall above the counter offers a great space for storage. If you want to have quick access to some common kitchen tools such as spatulas, ladles, and oven mitts, installing a hanging bar across the backsplash is a great idea. However, if the tools you use are taller than the standard height of upper cabinets, you want to mount your wall cabinets a little higher. To determine the perfect measurement, take the longest tool you use and then add 3-4 inches for the hang bar. That’s the ideal height for your upper cabinets.